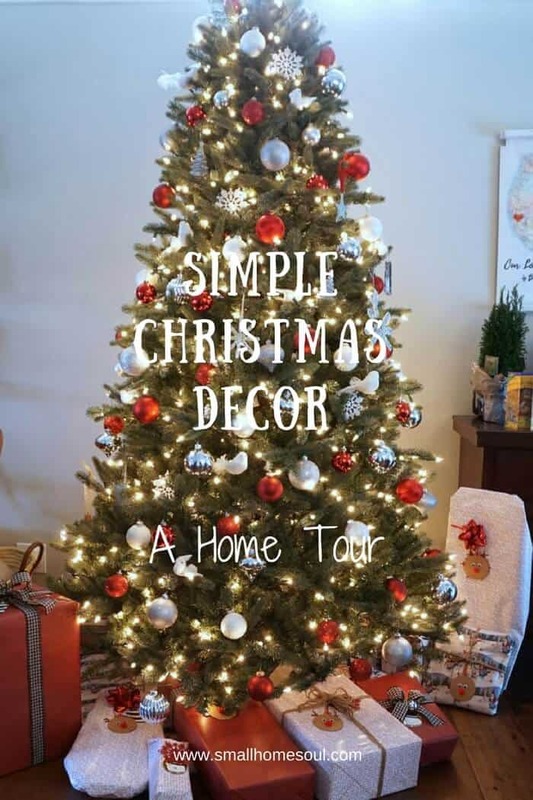 Simple Christmas Decor Home Tour - Girl, Just DIY! Friends, have I got a treat for you! Actually we, as in my blogging friends and I, have a treat for you. We’ve all seen the big elaborate holiday home tours where the homes are filled to the brim with every kind of Christmas decoration. Mantles, windows, shelves, dining rooms, kitchens, bathrooms, stairways and porches. I’m calling this tour my Simple Christmas Decor Home Tour. If you haven’t been around here long I am 51 years old which means I’ve been decorating my own home for nearly 30 years. Most years I never spend more than $20 on a new items, and some years I don’t buy anything new at all. I’ve collected over the years but I don’t decorate in all rooms of our house. I stick to the Family room mostly and a little bit in the dining room since that’s where we spend the majority of our time. 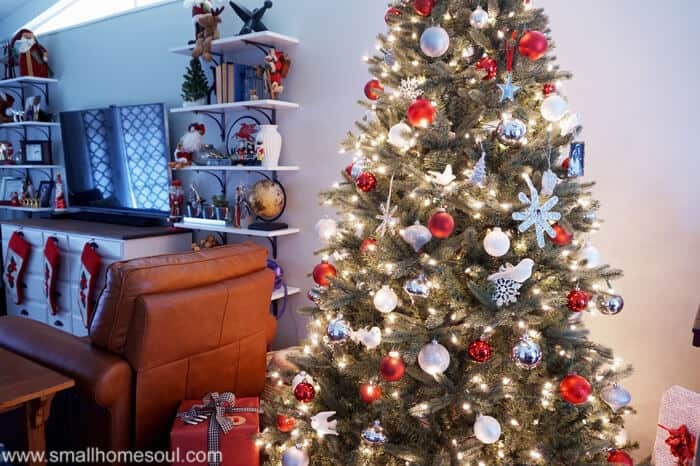 Let’s get started with the simple christmas decor tour, shall we? There are lots of pretty pictures to look at and I’ll share with you what I love, where I got it, and how long I’ve had it (if I can remember). 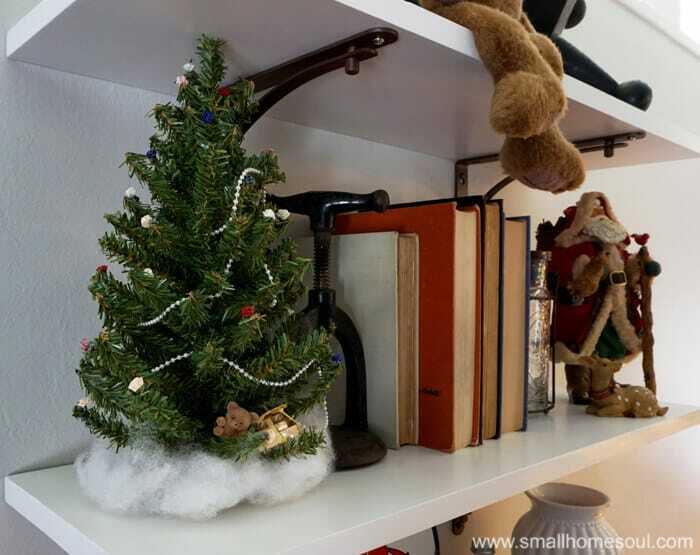 Recently I shared the post about installing these shelves and since we don’t have a mantle I sort of treated the shelves as my mantle. I might do something different next year but for now I tucked my Santas and other little Christmas decor knick knacks in and amongst the items already on the shelves. 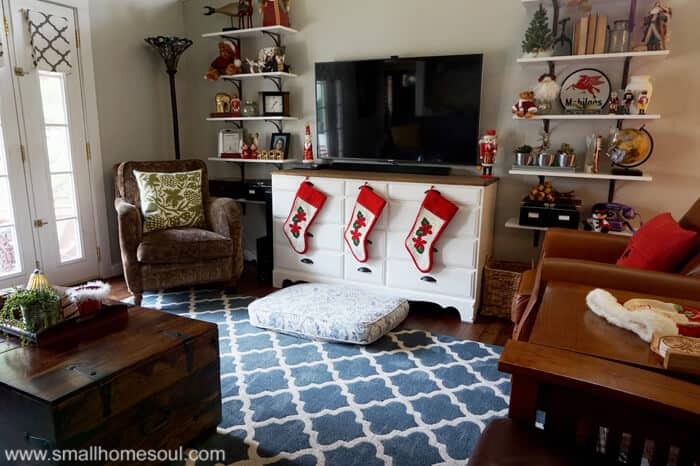 And I love that this year I have a place to hang our stockings on the front of our TV console. Ove them flanking the TV is a tall glass Santa ornament we got as a gift from our friend’s mom. She got it at TJ Maxx so it was a steal. And on the right is a Nut Cracker I bought at a drug store over 20 years ago for $5. Let’s take a closer look at some of my favorites on the shelves. 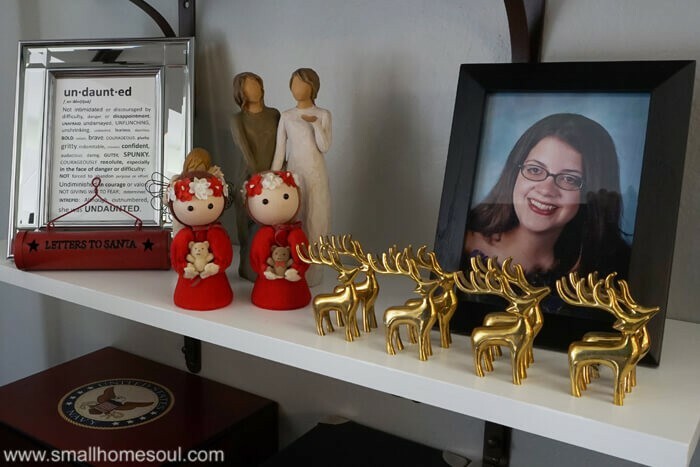 I love the red beautiful reindeer I bought at Home Goods a few years ago for $10. The sleekness of the reindeer contrasts nicely with the rustic stuffed Santa I picked up a few years ago. He was about $10 also. I don’t remember where I got the stuffed Santa bear, he used to keep me company during Christmas at my old job. My mom has always been super crafty. I remember her making and selling candles at Christmas time along with other cute crafts. She made this adorable little tree for me and one of my sisters many years ago. It’s lost some of the little roses on the tips and the pearl garland needs reset but I love setting it up each year. That awesome Santa on the right was another gift from my mom. She didn’t make that one, but she could have if she wanted. She’s that talented! I don’t recall where I got that little stuffed bear Santa, it might have been my daughters once upon a time. 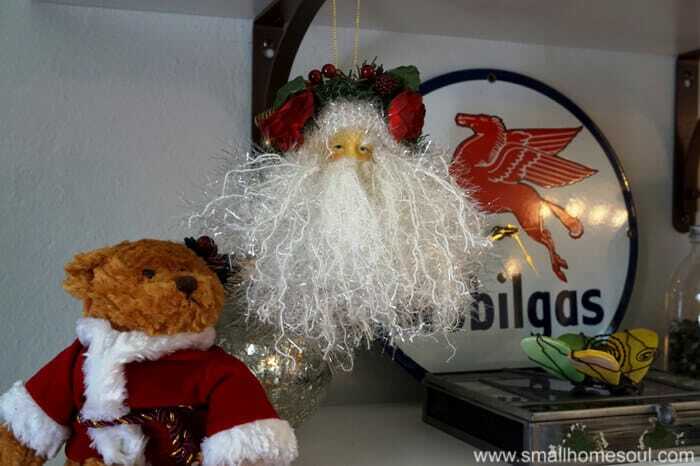 But that awesome Santa hanging from the shelf above I received in an ornament exchange at a job a very long time ago. He still looks fabulous as the day I pulled him out of the box! This isn’t the best picture (please forgive me) but I was battling the sun coming in through the window for the longest time. 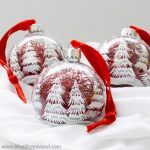 I just couldn’t do this simple Christmas decor tour without showing you one of my most favorite things. This Rudolph was made for me by my daughter 27 years ago and he’s so precious to me, taped antlers and curling feet and all. Maybe this is why I have a little obsession with reindeer. Have you seen the Rudolph Gift Tags I made? Christmas decor and decorating as a Christian wouldn’t be complete without a Nativity scene. Christmas day might not be His actual birthday (it’s estimated He was actually born in October) but I don’t care, it’s when we celebrate it and a Nativity is a great reminder of that special time. I really love this Willow Tree Nativity because they are simple, just like my Jesus was those many years ago when He was born in a manger. I’ve never added to my collection but I should probably make a DIY creche for it one of these days. 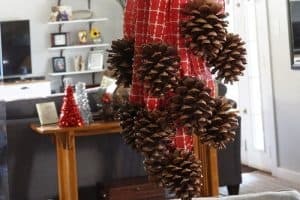 You may have already seen the Pinecone Swag I made and shared a few weeks ago. I love hanging it on the mirror for double the impact. So a few decades or more ago there were these home parties called Christmas Around the World. They had stuff from, well, all around the world. I bought this little wreath while at a friend’s party because it was one of the cheapest things in the book. 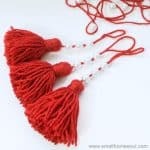 Now that I’m typing this I remember I also bought some sleigh bell garland. I still have the tarnished bells but finally cut it off the strings a few years ago. The wreath still looks as good as the day I bought it. I added that little red velvet bow to it for extra color when I used to hang it in my office at work. 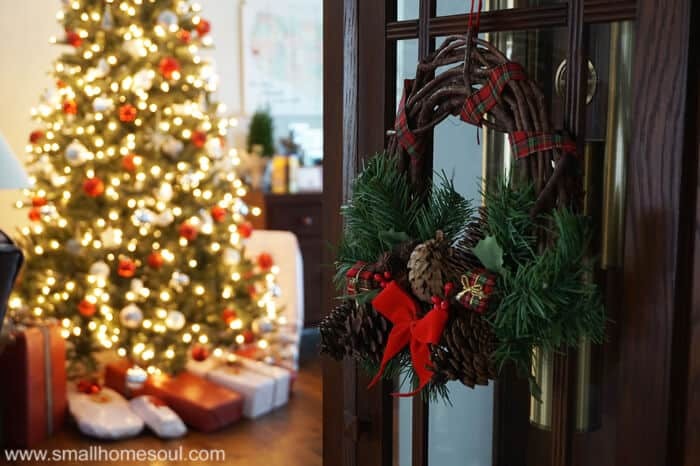 Decorating your home beautifully for Christmas doesn’t have to break the bank. 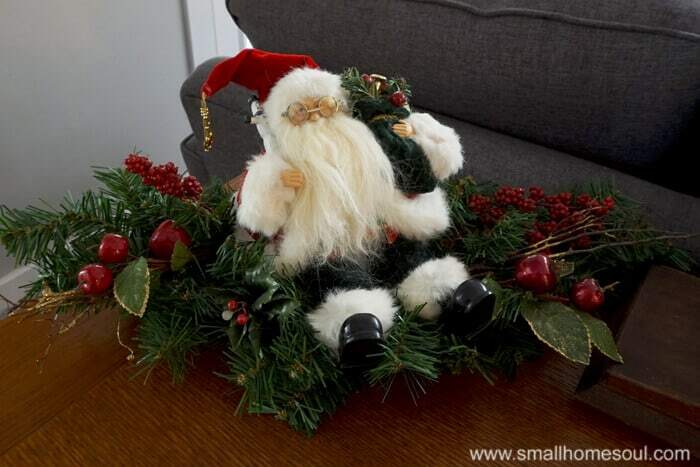 It’s very doable if you buy and collect things you love over time and stay away from really trendy Christmas decor. In the dining room I keep it pretty simple. I bought both the embroidered runner and the hurricane on a Facebook buy/sell site for under $8 for both. The hurricane looks so beautiful with the pinecones and ornaments stacked inside. Another beautiful contrast of shiny and rustic. Ok, I gave you a few peeks of the tree already. Here’s a view from the other side of the living room looking into the dining room. It’s the only place we can make enough space for it. We bought this faux tree about 5 years ago and we figure with the price we paid and what they are charging for a real tree today it’s already paid for itself. And we’ll have it for many more years. If I had to advise you on a big purchase I’d say this is Christmas decor money well spent. Here it is from the other side. You might be able to tell I struggle with the lighting in my house this time of year. In winter we don’t get much direct light and what we do is filtered through oak trees. And then it blasts through the overhead windows. But I think the tree looks spectacular in this shot (no editing needed). I think this is my prettiest tree yet. I say that every year 🙂 don’t you? Can you see my Rudolph gift tags 🙂 and the little rudolph doll on the top shelf? I’d love to show you the old fashioned tree topper we have but again, those windows were making it impossible to get the full tree in the shot and actually take a picture that wasn’t washed out. 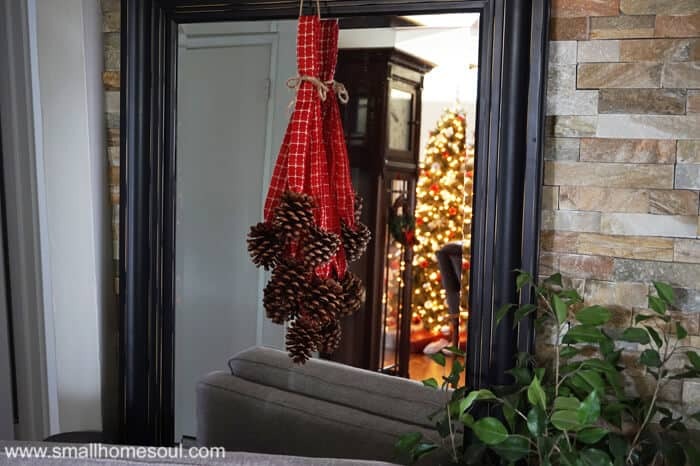 Before you check out all my friends’ Super Simple Christmas Holiday Decor below, don’t forget to Pin It so you can come visit again next year! Now go on over and give some love to my friends, and know that you are wished a Very Merry Christmas to you and yours! how did I miss this post? I love it, Toni! I love how you shared so many stories about your decorations and how special they are. I love the angels you bought when you were a single mom and the photo you shared of us of your beautiful daughter! I think my favorite is your nativity set! I am so happy to have met you in blog land! 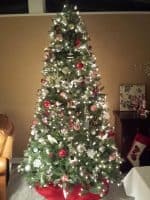 Toni, you’re home is beautiful, and I really enjoyed hearing the memories and stories behind your Christmas decorations! Toni….I love every bit of your home and all the sweet stories and memories you have shared. Between your mom and daughter…I am in love with everything!!! Thank, you so much Denise, it is family that makes Christmas so special! Thank you for your home tour. 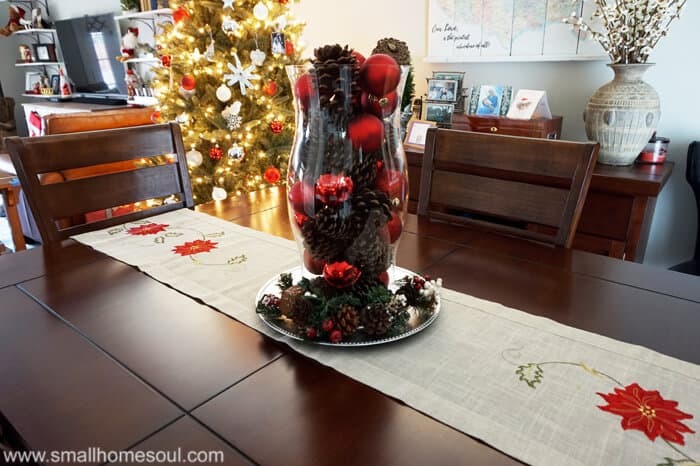 I really enjoyed it and will be stealing the hurricane pinecone centerpiece idea! 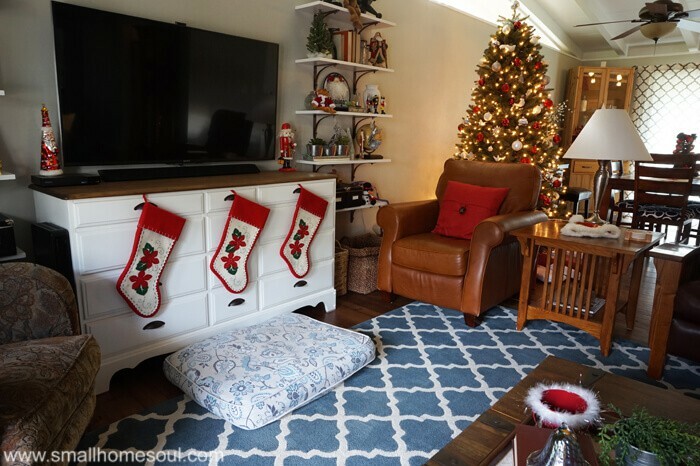 Love your Christmas home tour Toni. Everything about it is so warm and cozy! Wishing you and yours a wonderful Holiday season. I think I am adding the three wisemen to my willow nativity this year. I love the way your tree turned out! All of your little Santas remind me of home. Toni, I love your home tour! You know how I love things with stories behind them… And your home speaks to this perfectly! Thank you for sharing some your lovely memories to go along with your collection. ?? Thanks Anika, after so many years I finally had to glue the head back on one of them but they’ve held up well considering I just put them in the tub and don’t wrap them in tissue or anything special. 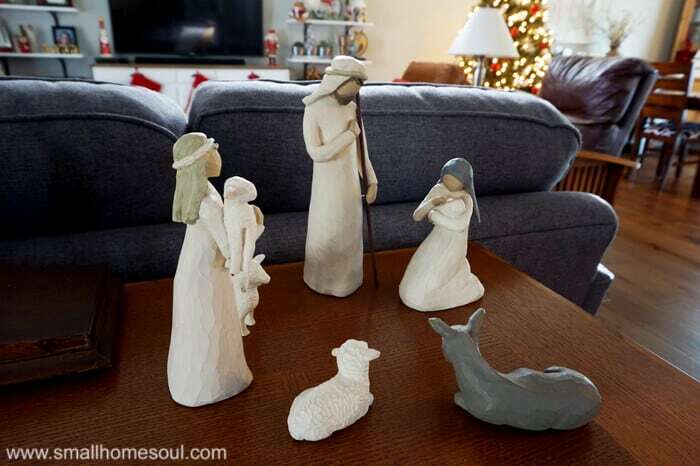 Your home is so pretty, and I love what you said about having a nativity scene in your home. This is so true especially for the kids to see. Your Pottery Barn raindeers are a great find. I can’t believe you found the whole set. Have a Merry Christmas Toni! Your home is beautiful Toni! And your tree is decorated beautifully too! Toni, your home is simply lovely! I see where you get your talent from with such a creative Mom! Every detail is just beautiful! 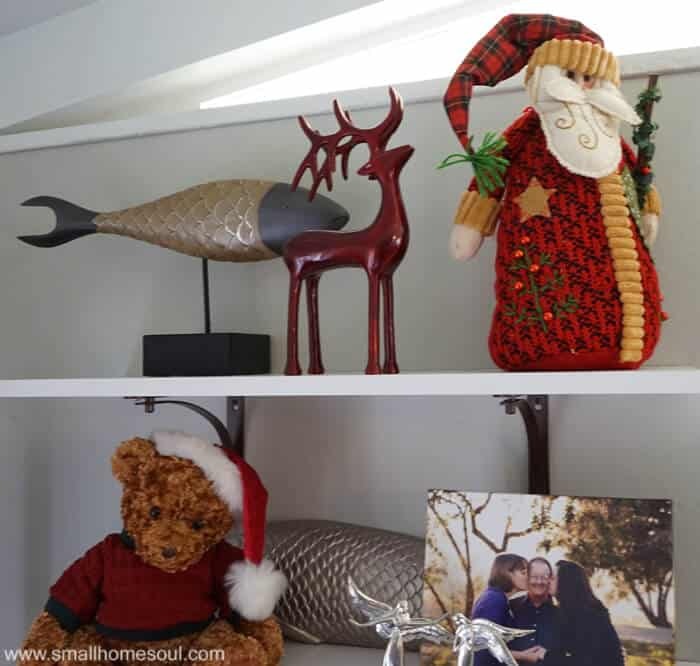 You have placed the pops of red perfectly throughout your home! Just a beautiful effect! Toni, I love your home tour. Sometimes the simpler things are better. I especially enjoyed your Willow Tree nativity. Merry Christmas and Happy New Year sweet friend. Thanks Lisa I love that nativity, it’s my most favorite of any I’ve ever seen. Yes, I like simple too, very much! Toni I love your home and all your collected decor pieces!! 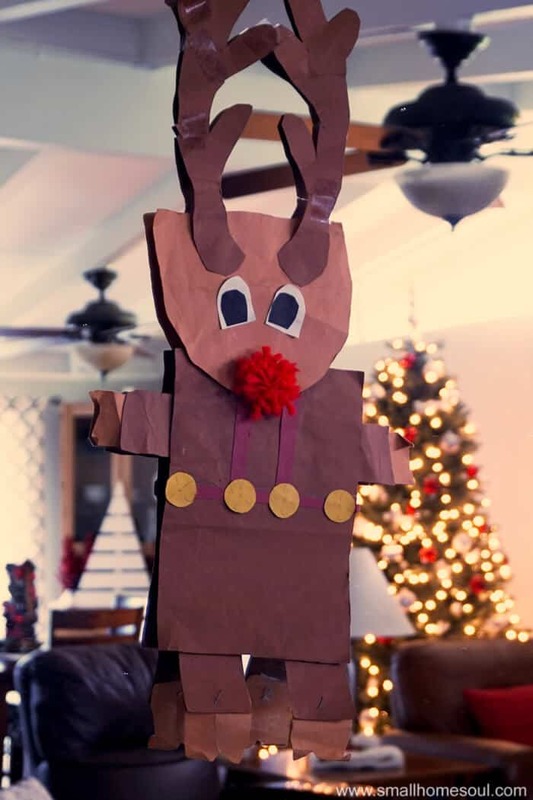 The Reindeer your daughter made is awesome and I am impressed that you have managed to keep it all these years!! 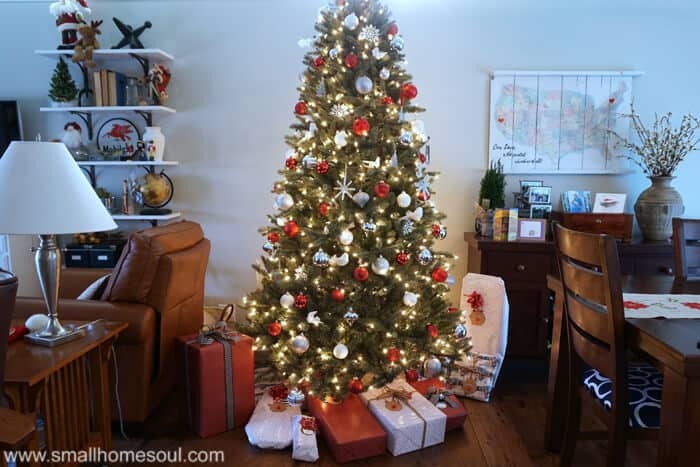 Your tree is beautiful and I agree, it is the best “big” Christmas decor purchase to make…I wish I had somewhere to slide mine away instead of putting it back in the box it no longer fits in (how does that happen anyway?!) so I wouldn’t even have to take the decorations off, lol! Have a very Merry Christmas!! Thanks Susanne, that is the last thing I pack and he goes into the top of a tub with enough space so he’s not squished. I love him!